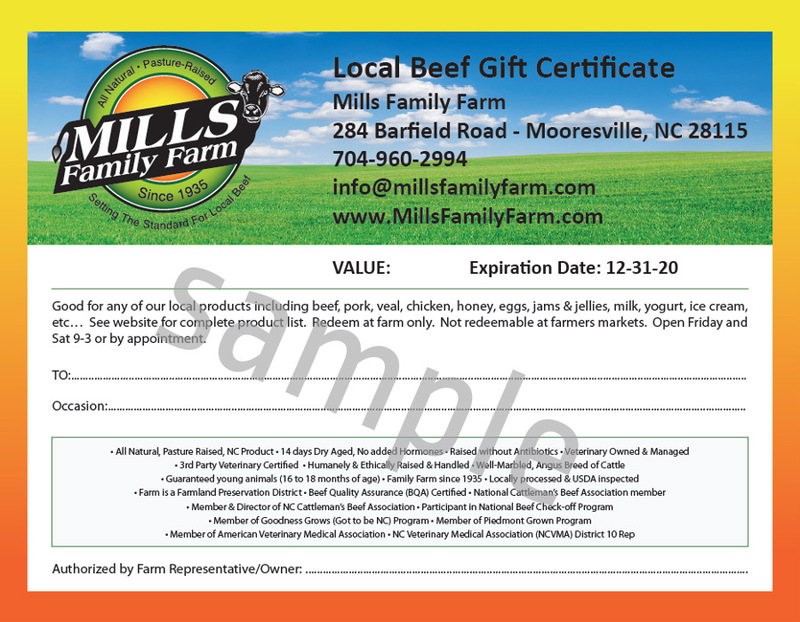 For quality, humanely raised & handled beef, pork & chicken, visit Mills Family Farm in Mooresville, NC. We’ll help you feed your family right! Buying local meats from us at Mills Family Farm is beneficial to you in many ways. For one thing, local meats are fresher and do not have any additives to enhance appearance and flavor or increase shelf life. This makes the meat not only taste better, but it also is much healthier for you and your family. When you choose to buy wholesale meats from Mills Family Farm, you also have peace of mind knowing that the animals are never given any hormones and are fed an all-natural diet. This provides you and your family with safe, healthy, and tasty meat. The Mooresville community benefits when you buy local quality meats, as well. It helps to cut down on fossil fuel usage and green house gas emissions, as local beef is not shipped long distances. The vast majority of the money you spend goes to local farmers, as opposed to less than 25 cents of every dollar spent on food at a grocery store chain. By buying from Mills Family Farm, you are supporting your local economy! At Mills Family Farm, we sell wholesale meats, including beef, pork, and chicken. We are located in Mooresville, North Carolina, and we are distributed to restaurants and retail outlets throughout the Carolinas. Health – Local beef is fresher and sold without the addition of additives to enhance appearance, flavor or increase shelf life.